When the weather’s nice, taking a walk up to Hoboken is not entirely out of the question. Hubba Hubby and I both enjoy being outside, so a 40 minute walk one way to grab lunch and wander the very cute Washington St. in Hoboken is totally normal for us. I must admit that now that I’ve been around Hoboken a little bit, I’ve noticed that the crowd is either young/college age kids, or 30-somethings carting around their progeny in Uppababy Vistas and Cruzs, some Bugaboos. (Can you tell I’ve been stroller-shopping?) As my friend Cara said — “it doesn’t matter where you are in Hoboken, someone’s sh!tting their pants or throwing up, sometimes both” – hahaha. 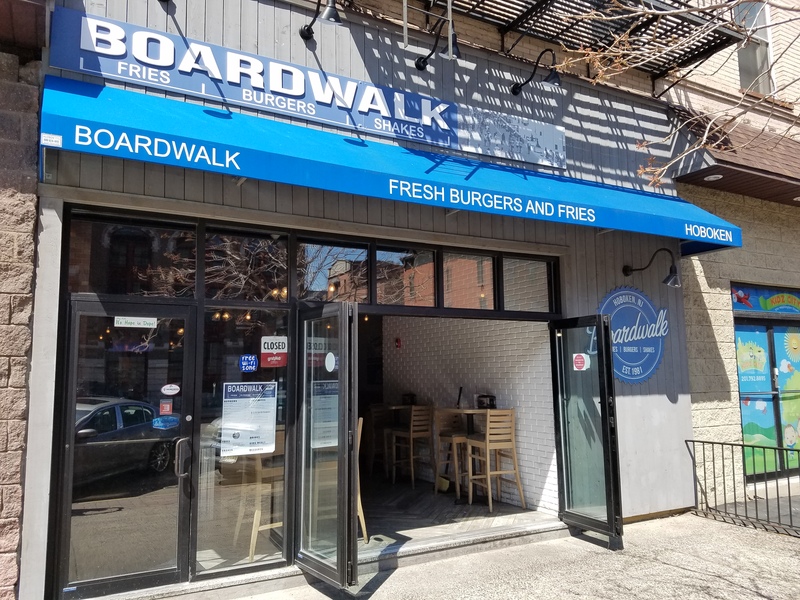 On this bright and lovely day, I chose Hoboken Boardwalk as our lunch destination. Hey, walking 2-3 miles gets your appetite going, right? Our food took a few minutes to arrive. 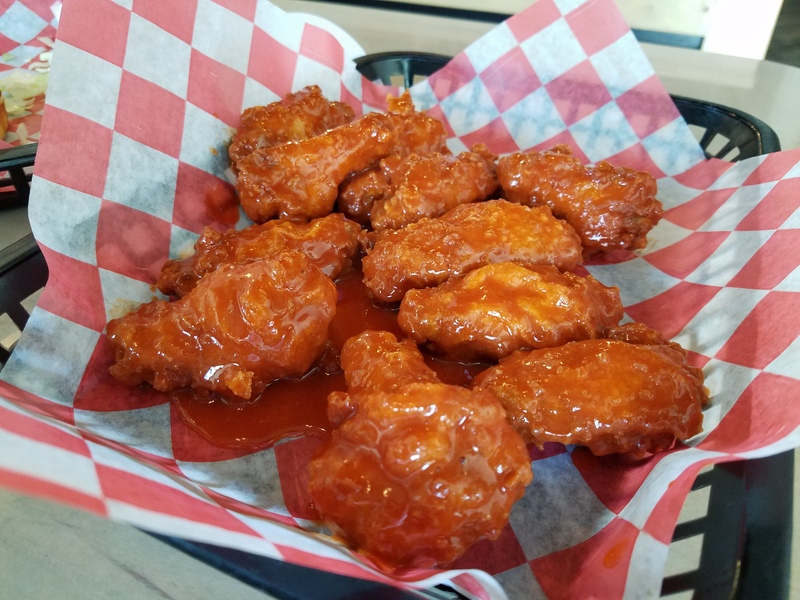 First up: hot wings. Hubba Hubby described them as “slimy” and when I tried one, I was inclined to agree – the texture was soft, like they were fried, then soaked in hot sauce for too long. The wings were otherwise… fine? but I would definitely not order these again. 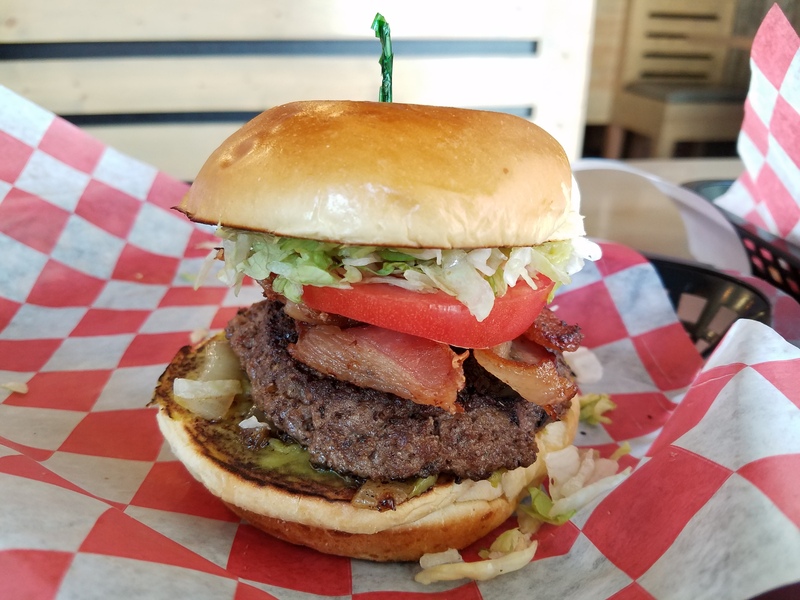 Hubby ordered the avocado burger; I tried a bite and thought it was OK. The patty was a little overdone, and it needed mayo or some other ‘wet’ ingredient to make it come together better, but otherwise — just fine. Not great. 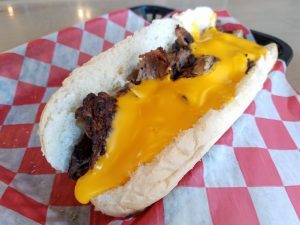 Because I have a faulty memory, I thought someone had said the cheesesteaks here were good. 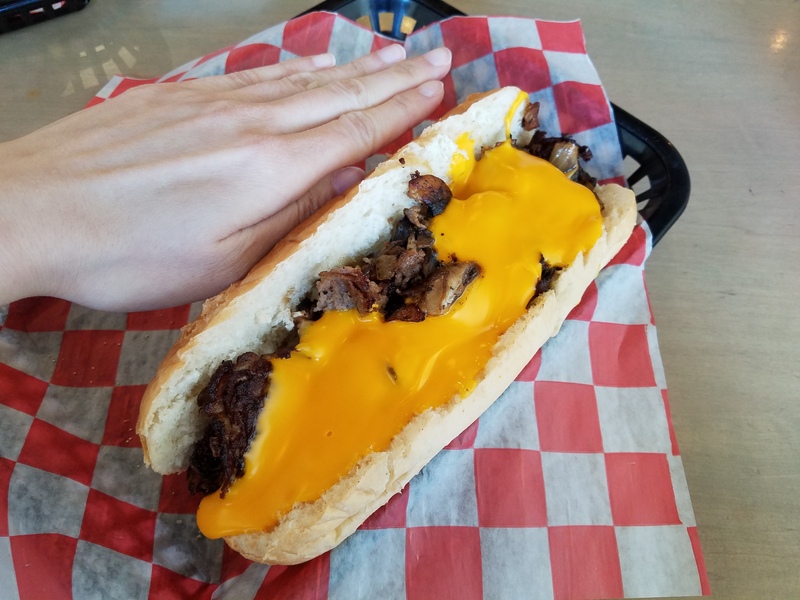 I ordered a regular (Cheez Whiz, onions) and added mushrooms. Because I’m a rebel like that. It looked promising when it came – sorta, the cheese should be more on one side and further ‘down’ into the bread than it is, but not a huge failing. The sandwich was huge, though, clocking in at 7+ inches of sandwich. 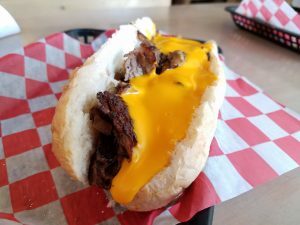 In the end, though, while the bread was the type of bread I want my cheesesteaks on – squishy and just a vehicle for what’s inside – the sandwich was just not good. 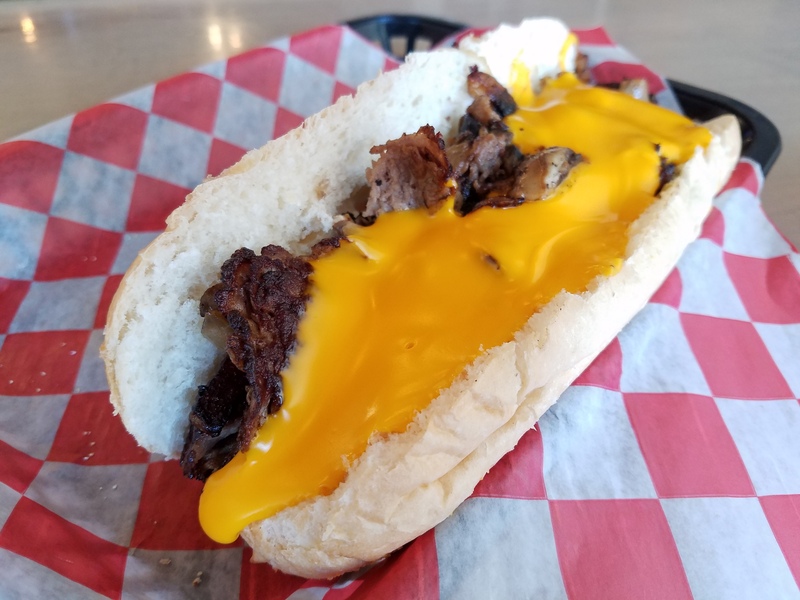 The cheese kept squishing out because it was only on top, the steak was fine, the mushrooms and onions fine, but — and this is super unlike me to say this — there just wasn’t enough ‘stuff’. I’d be fine with a shorter sandwich, same amount of meat, but in these sandwiches, I shouldn’t be tasting bread. I should be tasting meat/onions/mushrooms/CHEEZ WHIZ. However… the real reason we came here was I saw a pic of these fries and basically NEEDED THEM IN MY LIFE. 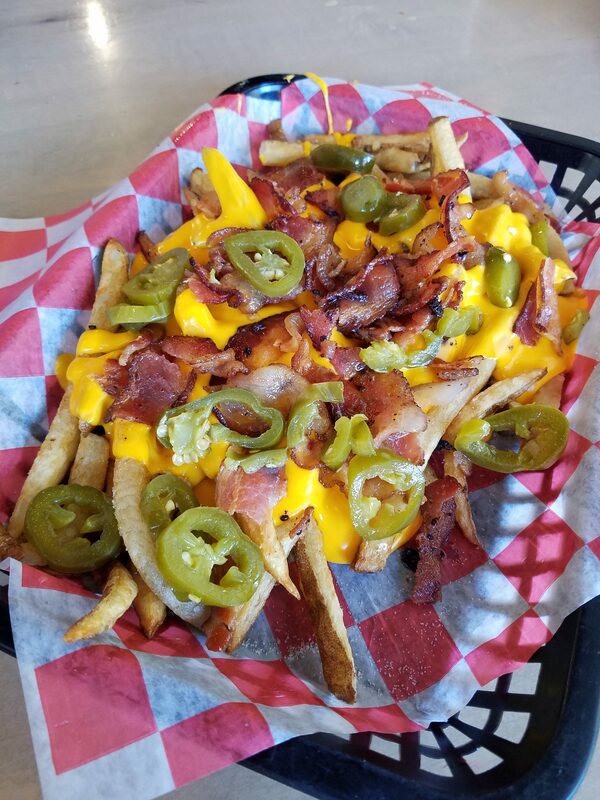 We ordered the bacon cheddar fries and added jalapenos. Because… bacon. And jalapeno. Oh my gosh you guys, totally redeemed the place. The fries were perfect crispy vehicles for loads of cheese sauce, the jalapenos were – well, jalapenos – and the bacon bits added the right bit of meaty savory flavor to the fries. I was super happy. There was even – gasp! dare I say it?! – too much cheese sauce in the end, so no fry went naked! We had a puddle of cheese sauce on the bottom of the tray when we were done… mm, so good. I would definitely, absolutely, no questions asked return to order just this again. And maybe a milkshake — they hadn’t yet had ice cream delivered for the season when we went, so I’d love to try a milkshake. Honestly, I wanted to love this place more than I actually did. The service was super friendly and helpful (countertop ordering, they bring it to your table), the place itself with chess boards and pieces on the tables was super cute – there was a lot to love about the place. Unfortunately, the wings, burger, and my sandwich weren’t among those things. But the fries? and that it’s BYOB? 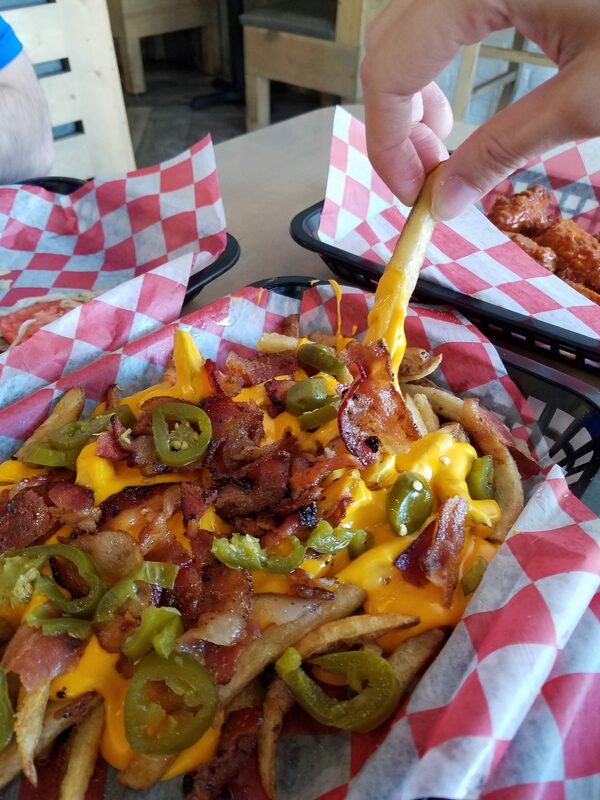 yeah, I can handle that — an order of fries would fill me up anyway, so it’s not like I NEED to order other stuff. I’ll definitely be back for fries — and hopefully a milkshake — but we may need to find other fortification at another local place. No worries though — I’m sure I’ll be back in Hoboken in no time! *When I went to look up the address just now, I realized it’s a chain with over 100 locations around the country – though the closest to NYC is in Hoboken. Oops. Interesting!! Now I feel less badly about kind of dinging a local place.